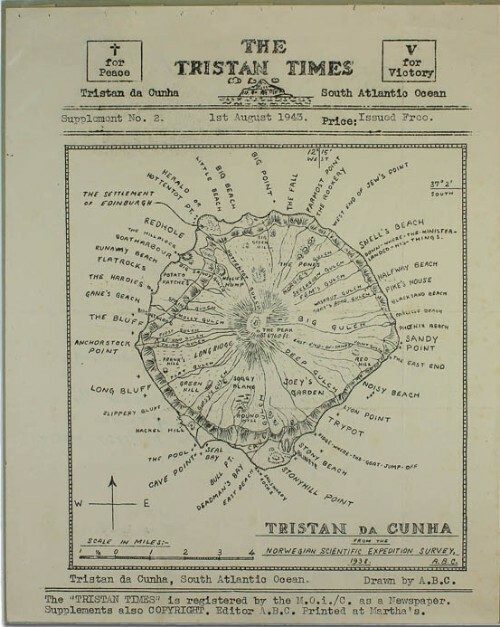 Weather Forecast for Tristan da Cunha / Edinburgh-of-the-Seven-Seas and and Weather Warnings for United Kingdom and Oversea Territories. (short version - more in the SHATPS publication - The South Atlantic Chronicle). 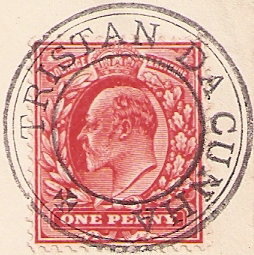 Until 1940 no censor mark appeared on Tristan covers. In use were the then current handstamps Type V, VI and VII. 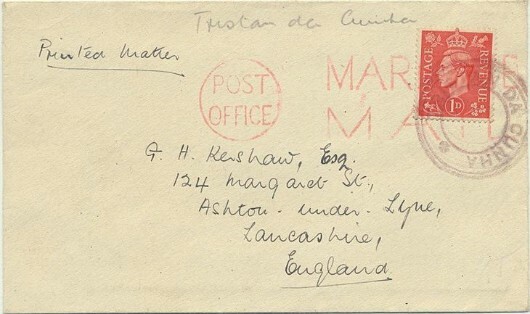 - censor marks applied on mail from the islanders or personal of the Garrison or the Meteorological Station on Tristan da Cunha. When HMS Queen of Bermuda anchored off Tristan on the 24th August 1940 with the order to Rev. Wilde to embark as fast as possible, the clergyman removed the Type V handstamp. 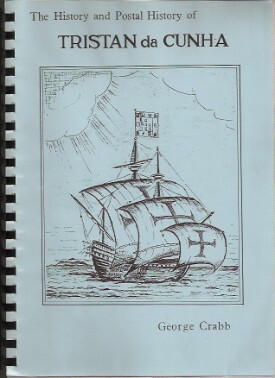 There was not much time for the Reverend to prepare any covers because he was urged by the ship’s captain to hurry up. But once on board the warship, Rev. 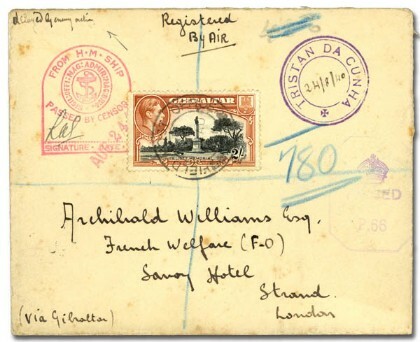 Wilde struck a few covers (of which 4 are known) with the Type V handstamp which were censored by an unknown censor officer, who signed the tombstone censor marking with “R.A.S.” and with a one line date handstamp of AUG 24 1940 with red ink (fig. 1). Let me say a word about the naval “tombstone” marking. 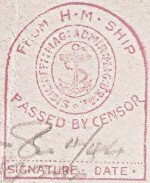 That ship’s censor was in use during WW2 on British ships worldwide. Today the price of such a cover is low and many censors cannot be identified, nor can the ships where the covers were posted. Very different to the common usage of the “tombstones” are the covers posted on or off Tristan da Cunha. The censors and the ships they belong to are usually identified (perhaps not all?!?) and these covers are worth reasonable more. 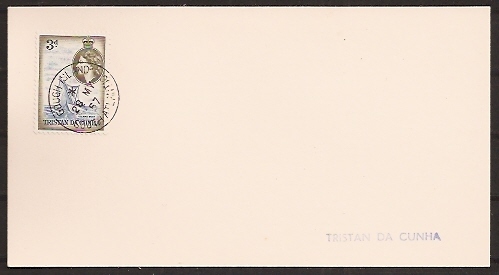 All censored covers of Tristan are highlights of a postal history collection of that island. But – you have to know the initials or signatures of the censors! 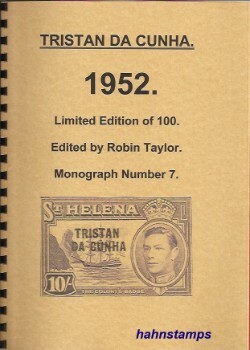 During 1940 no tombstone censor mark was available on Tristan da Cunha. When the Union Castle ship Carnarvon Castle, an armed merchant cruiser visted Tristan on the 15th November 1940, a few crew covers were censored by the ship’s censor Surgeon Lieut. 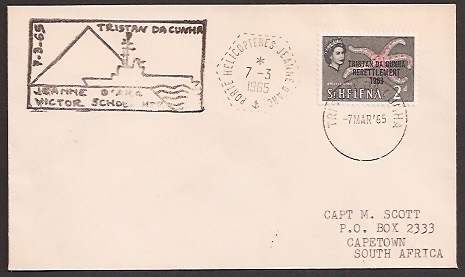 John Stride but no Tristan cancellation was applied, because the mail remained on board the ship (only 3 cover are known). 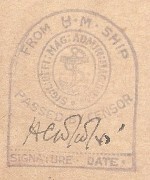 The island mail was handstamped with Type VI or VII and received no censor mark (fig. 2). Upon the arrival of Dunnottar Castle on the 5th April 1942 the first consignment of forces personal landed (with Allan B. Crawford) to build up a Naval station as well as the wireless and meteorological offices. The 2nd consignment arrived aboard MS Cilicia on the 10th May 1942, also the Naval Surgeon Commander E.J.S. Woolley and the Naval Chaplain, Rev. Cyril Percy Lawrence. With a naval base and military personal on the island the concealment of all military action and presence on the island was found necessary for security reasons. was used. But be careful: Robin Tayler investigated and published his results in the Chronicle of April 2006, that the address P.O. 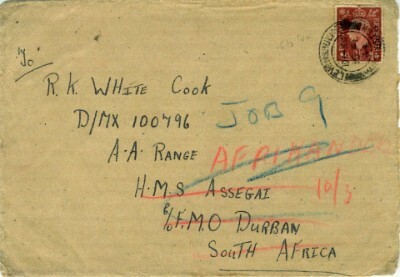 Box 59 was in fact the postal address of HMS Afrikander at Simonstown. 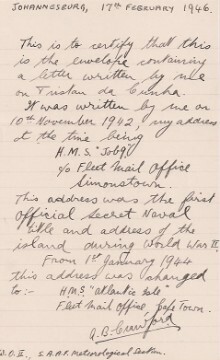 There is only a connection to Tristan da Cunha, if the address war crossed out and the cover was forwarded to HMS Job 9 or HMS Atlantic Isle. 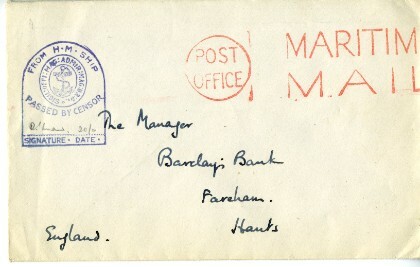 In a former letter from Agnes Rogers, written 13th May 1943, enclosure to cover fig. 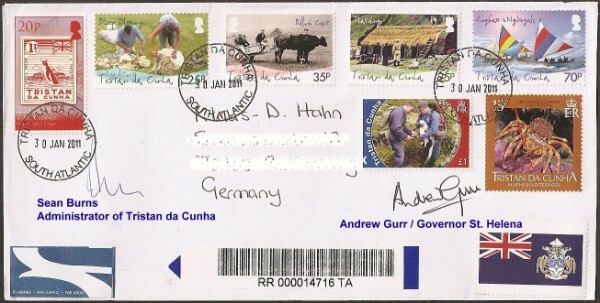 3, the name “Tristan da Cunha” was mentioned in the letter. Consequently a British naval-type censor mark “tombstone” came in use, brought to the island by Comm. Woolley, but no censor tape was used on Tristan during WW2. From now on Comm. Dr. Woolley (fig. 4) and Rev. 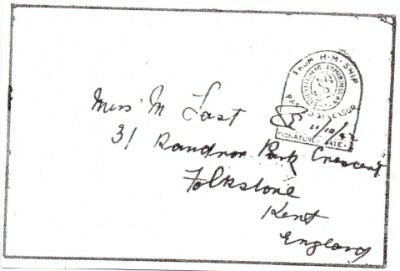 Lawrence signed the tombstone censor marks on the outgoing mail and the use of the type VI and type VII handstamps and any other “Tristan markings” on the envelopes was forbidden. Only 2 censored covers signed by Rev. Lawrence are known (13th October 1942 and 10th November 1942). The Reverend was a keen photographer and some of his b/w photos were struck on the reverse with the red tombstone censor mark and signed (fig. 5). Beginning with the No. 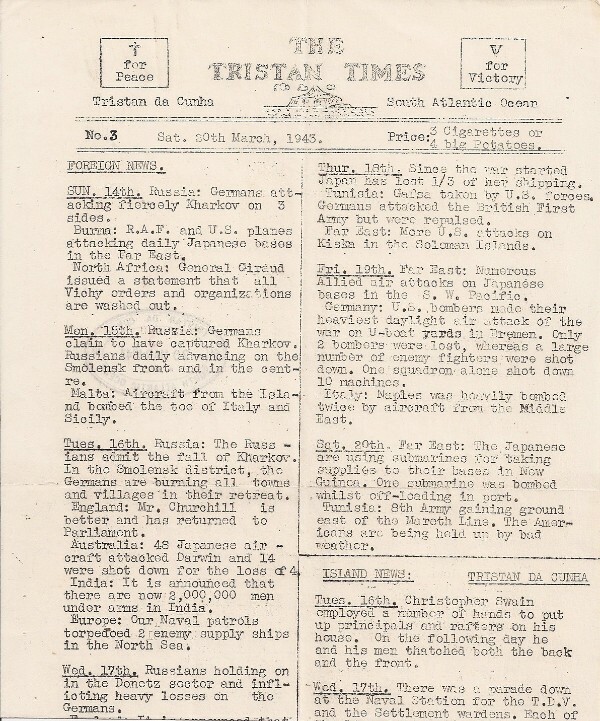 1 on 17th March 1943, Allan B. Crawford issued the first weekly newspaper on the island – THE TRISTAN TIMES. 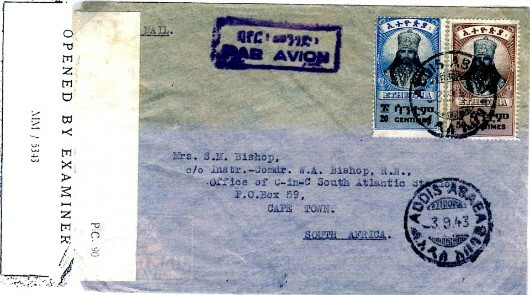 Each issue was struck on the reverse with his personal handstamp and the number of the newspaper handwritten endorsed. Only a few censored covers signed by Comm. Woolley are known until he and Rev. 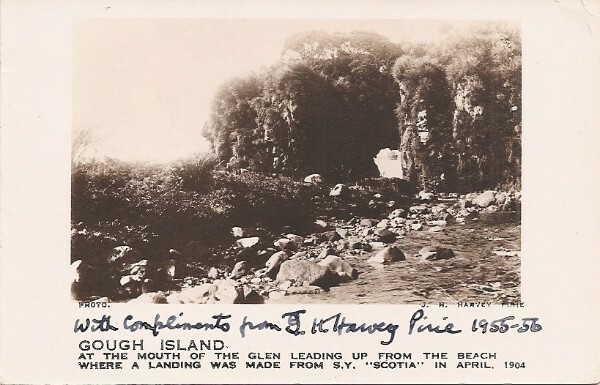 Lawrence left the island aboard the ship Empire Friendship on the 1st July 1944. They were replaced by Surgeon Lieutenant-Commander H.S.A. Dr. Corfield (fig. 6) and Rev. D.I. Luard. Only one cover is known censored by Rev. Luard (fig. 7). 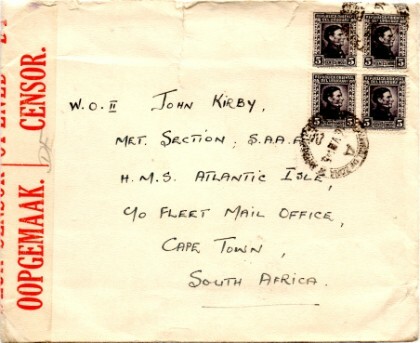 The most common censor of all existing mail was Dr. Corfield, even if all censored covers are very rare! 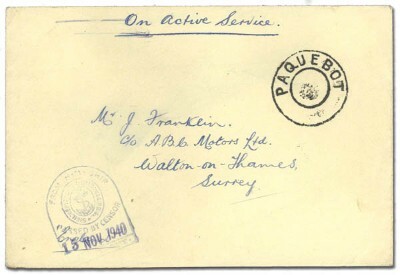 Some of the covers were handwritten marked “On Active Service” or “Civilian Mail” and some received the London “maritime mail” machine cancellation (fig. 4, 6, 7, 10). 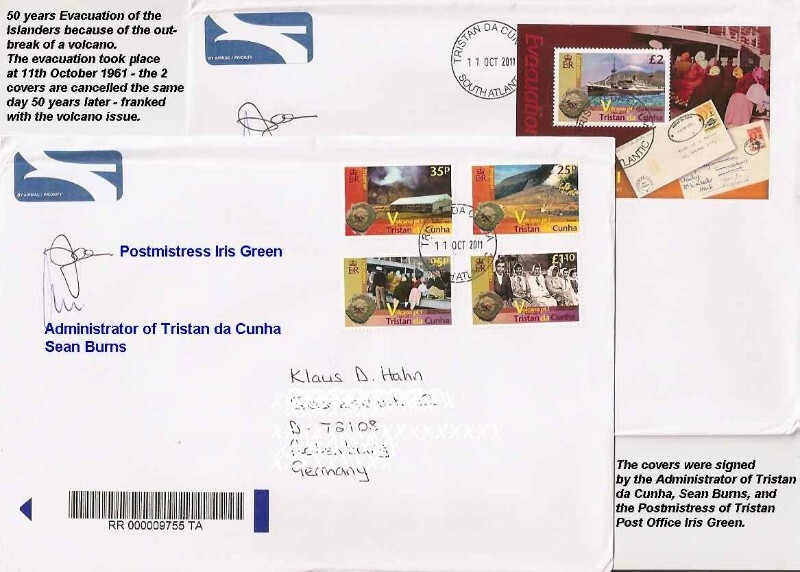 scans required - outgoing Tristan cover censored by foreign countries (all except South Africa). fig. 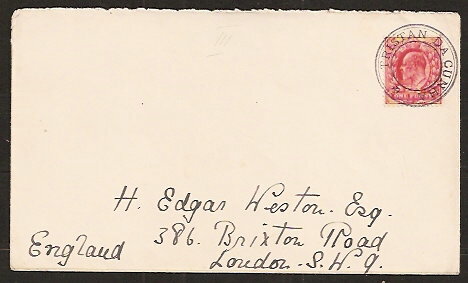 1 - cover with Type V handstamp and censored "RAS" aboard HMS Queen of Bermuda, additional British censor in transit Gibraltar Field Post Office 475, 19 AUG 1941 and handwritten "delayed by enemy action"
- some Supplements were published too. 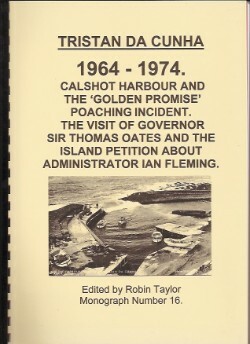 On 20th June 1969 a call for help reached the Tristan community. Two meteorologists on Gough Island wanted to return to their old base a few miles away and were missed. The South African destroyer S.A.S. Simon V.D. Stel with a helicopter was sent from Simonstown. A rescue party of 10 Tristanians was collected and they found the 2 men on Gough Island dead, presuambly from exposure. 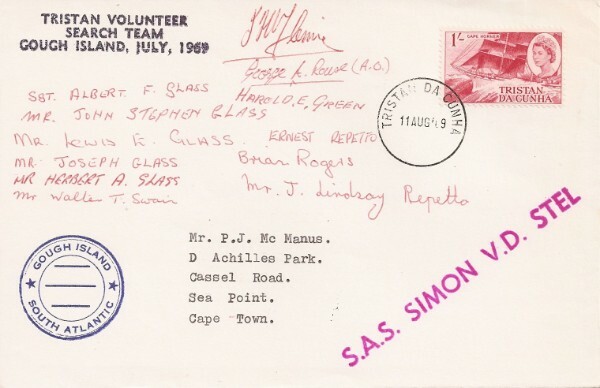 The Expedtion team was landed on 13th November 1955 on Gough Island as part of the International Geophysical Year 1955/56. 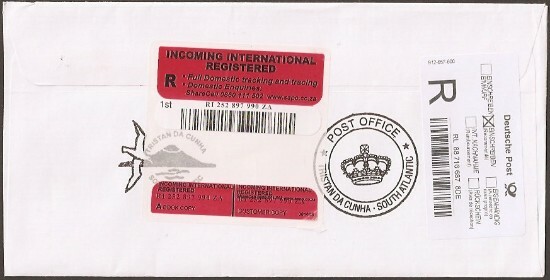 As an agency of Tristan Post Office a postal service was installed. 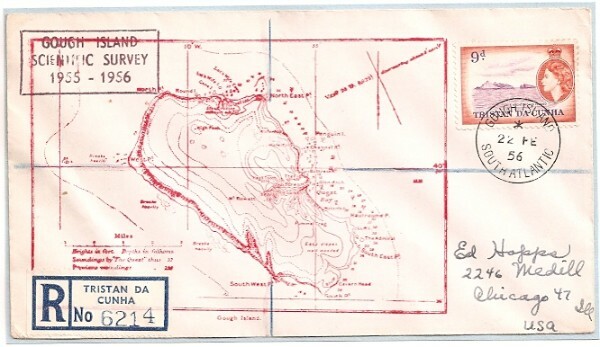 The expedition had his own Gough Island handstamp in use from 14th December 1955 to 27th May 1957. 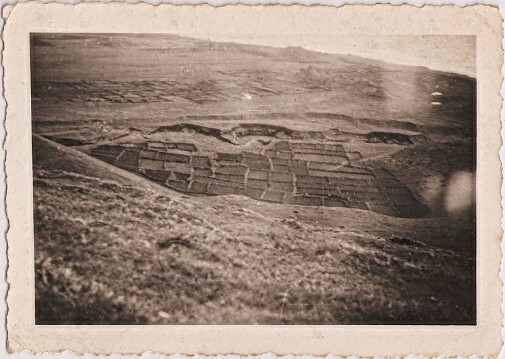 Leader of the joint British and South African team was Robert Chambers, who had to be evacuated to Tristan because of a back injury at the landing of the expedition. His successor was M.W. Holdgate. Dr J H Harvey Pirie, geologist, bacteriologist and medical officer of the Scottish National Antarctic Expedition of 1902 to 1904 that visited the South Orkney Islands and the Weddell Sea, as well as Gough Island, settled in South Africa after the First World War. He worked in the field of bacteriology at the South African Institute for Medical Research until 1941. He died on 27 September 1965. Last Day Souvenir Card. 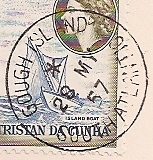 The Gough Island Post Office (sub office of Tristan da Cunha) was closed on 27th May 1957. 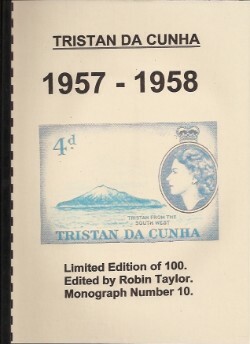 The one line cachet "TRISTAN DA CUNHA" is scare and seldom found on covers. 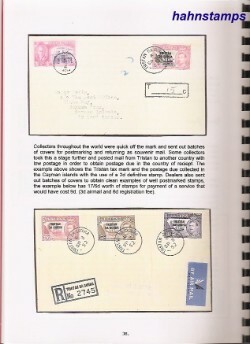 The one line cachet is listed on the list of required Post Office equipment before the opening of the first Tristan Post Office at 1st January 1952. 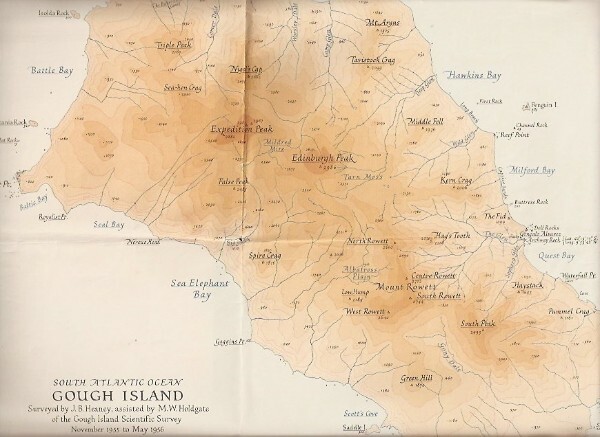 Let's make a step backward to 1947, when Allan B. Crawford stayed on Tristan da Cunha he got a call to lead a South African expedition to Marion Island, 1.200 miles south east of the African continent and with S. African sovereignity to establish a new met. station. 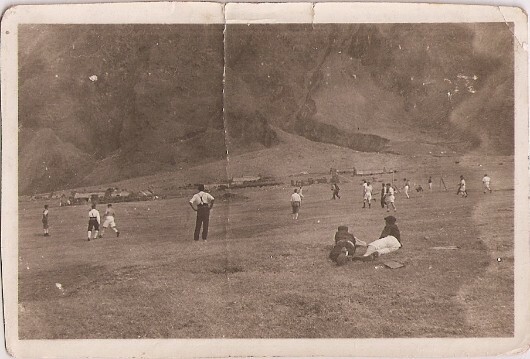 With 6 Tristan Islanders ABC worked on Marion Island beginning in January 1948. 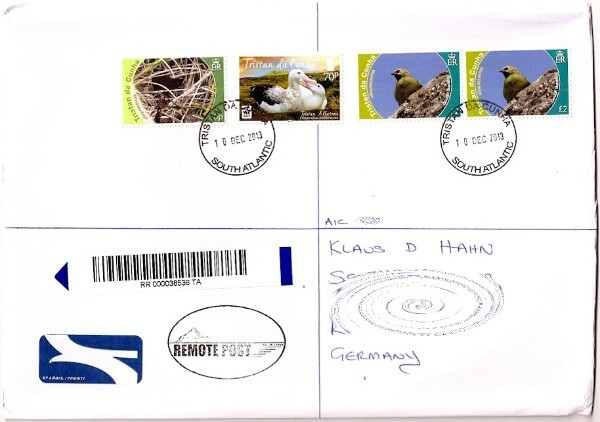 He opened a Post Office and used a boxed cachet MARION ISLAND SOUTH INDIAN OCEAN in connection with a datestamp. 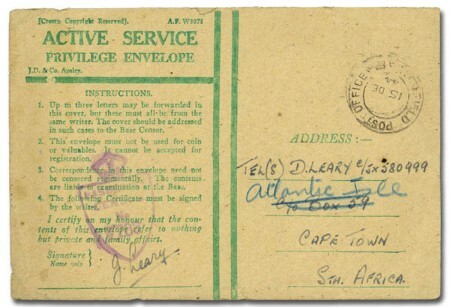 The covers were datestamped later in S. Africa. 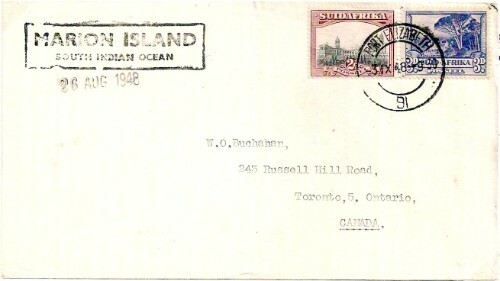 Here's a cover to Canada of 26 AUG 1948 datestamped 31 X 48 in Port Elizabeth. 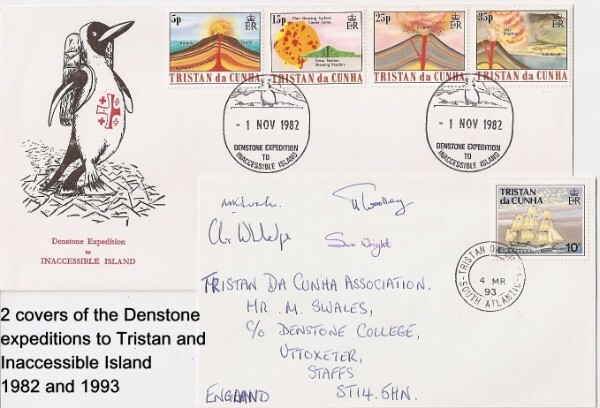 In 1982 the first Expedition of the Denstone College took part on Inaccessible Island. A private expedition cachet was used. 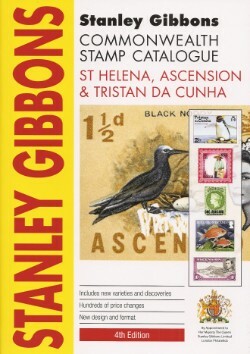 The second expedition 11 years later was limited to the investigation of birds and ferns on Tristan da Cunha. 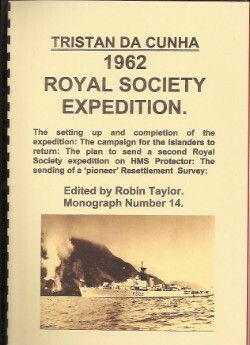 The 4 members of the expedition (leader Michael Swales) signed on the pictured cover - only 17 signed covers were made. Governor Andrew Gurr made his first Tristan visit after his appointment in 2007 aboard the RMS St Helena arriving on Sunday 30th January 2011 for a three-night stopover until Wednesday 2nd February. Sean Burns arrived on 9th September 2010 aboard SA Agulhas and was sworn in to become Tristan da Cunha's 21st resident Administrator on 15th September. Both signatures on that registered Air Letter datestamped at the day of arrival of Governor Gurr (the blue explanations are not on the original cover!!) - thanks to the islander who helped to gain the signatures!! My thanks goes to all collectors providing scans for publishing!! Copyright © 2010-2015 Klaus Hahn - The copyright of that home page remains with the author Klaus Hahn.